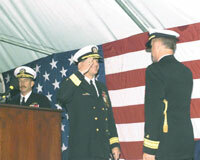 Rear Adm. Kenneth E. Barbor, right, turns over leadership of the Naval Meteorology and Oceanography Command to Rear Adm. Thomas Q. Donaldson, center. At left, Rear Adm. Richard West, oceanographer of the Navy, addresses those gathered at the ceremony, which took place at the Naval Construction Battalion Center in Gulfport, Miss., last month. The General Services Administration has named Christopher Fornecker chief technology officer. He will report to GSA's chief information officer, Michael Carleton, the agency said. As chief technology officer, Fornecker will set and enforce the development of policies and procedures, evaluate technology options, maintain vendor relationships and monitor projects, agency officials said. He also will be charged with ensuring that all strategic and tactical initiatives promote the agency's information technology vision, GSA officials said. Fornecker formerly was assistant deputy undersecretary of Defense for advanced systems and concepts. He was commissioned as an Army signal officer in 1972 from the U.S. Military Academy and holds a master's degree in electrical engineering from the University of Massachusetts.